T hose who have followed my articles know how often I speak about my last master, Ch'ang Tung Sheng. I have recalled in some detail memories of my experiences with the Master in an article entitled "Will The Real Ch'ang Tung Sheng Please Stand Up." As I said in that article, I began to realize how famous Ch'ang was in Taiwan, where Ch'ang acted as Chief Judge in my fight with Wu San Ju (see photo below 1). After the fight Ch'ang presented me with the Flag of Mei Jung Style (see photo below 2). Master Ch'ang was not for all students. Yes, Ch'ang was my last teacher, but I was ready for the Master teachings because I was already primed by other noted Masters in my life. Without the teachings of these Masters I'm sure my martial arts karmic road would have been much different. At the point in my life when I met Ch'ang, I knew there was something missing in my training. I doubt anyone could have filled that gap but Ch'ang himself. I needed to know about Shuai Chiao, and who better to learn it from but the best? Working with the Master was the icing on the cake. I knew that my past teachers were indeed excellent, for Ch'ang demanded a good basic understanding from his students. My past teachers taught me well, and the Master said so after seeing me fight. I was ready for whatever Ch'ang would teach me, thanks to them. Let me tell you about one such teacher with whom I am very honored to have studied. He, like many Chinese, used an American name- Franklin Y.C. Kwong. His Chinese name was Kwong Yung-cheng. Master Kwong was a native of Canton, Mainland China, but he later moved to Taiwan. When I met this quiet and unassuming Master he was living in a moderate apartment in the Flushing area of New York. He was my classmate when I was learning Chan Meditation under Master Rev. Shen Yen. I had had previous training under other Chinese teachers in New York's Chinatown, so I was already acquainted with Tai Chi. However, I found Master Kwong's method of instruction to be very complete, covering all aspects of Tai Chi Ch'uan. What I learned from him raised my level of understanding a great deal. Because of Kwong's teachings my skills in the solo form and Tai Chi Sword Form improved greatly. His movement was beautiful to behold. His form, structure and precision were perfect, and he had a storehouse of information on tway shou (pushing hands) techniques. Kwong was a highly educated man. 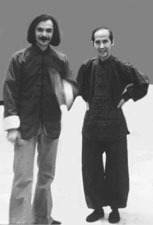 (see photo to right of Master Kwong and myself) His schooling was very impressive. He went to Sun Yat Sen High School, in Canton, China in 1934. He moved on to Sun Yat Sen University, in Canton, China earning his BS in Electrical Engineering in 1938. He furthered his education by going to New York University, earning his MS in Electrical Engineering in 1941. He graduated and worked at the Taiwan Power Company in 1953. He specialized in planning and designing power generators. In the early 1950's he taught at Chieng Kung University in Taiwan and Hwa Kio University in Macao. Master Kwong's martial arts background is impressive. He was the disciple of Yang Ch'eng-fu and his oldest son Yang Shou. He also studied with two of Ch'eng's top students, Chen Wai-ming, and Ying-chieh. Because of his extensive knowledge of Tai Chi Ch'uan he was known as the "Professor of Shadow Boxing." Master Kwong's Pa Kua teachers were also very famous, namely Chien Yun who was the daughter of Sun Lu Tang, and Fu Chun Shoong. He studied the classical eight (8) mother form, the Pa Kua Sword, as well as the rare Palm of the Dragon Pa Kua, a form not seen in this country until Kwong came to the United States. Master Kwong's Hsing-I teacher was Sun Tsing Chow, who was the son of the famous Sun Lu Tang. He also knew the Sun style of Tai Chi Ch'uan. He was instructor to Vice Admiral Doyle, former commander of the U.S. Taiwan Defense Command. He was host instructor for a show on Taiwan Television called "Let's Learn Tai Chi Ch'uan" from Jan. 14th, 1964 to Dec. 27th,1965. He was the teacher of Mr. Houphouet Boigny, the president of the Ivory Coast, Africa. He was sent as a representative of Taiwan to teach the president Tai Chi Ch'uan and Tai Chi Jen (sword) fencing. Although he planned to stay a short time, he spent five years teaching in the Ivory coast. He has been written about in a number of books. Two in particular are: "The Fundamentals of Tai Chi Ch'uan" by Wen-Shan Huang, printed in 1973, by South Sky Book Company in Hong Kong, and he is mentioned in Robert Smith's book Chinese Boxing. One of Kwong's classmates was the noted Cheng Man-Ch'ing of Taiwan. Kwong was a small thin man. He was 5' 3", and his body weight never exceeded more then 110 pounds. 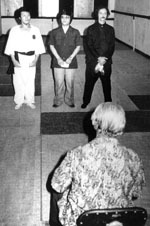 At first glance you would not suspect that he had Kung Fu skills (see photo to right of Master Kwong, another of my teacher's: Chung Tsai, and myself), but in fact, his skills were superb. His original reason for studying Tai Chi Ch'uan was to improve his health. Kwong had suffered digestive problems, headaches, and sleepless nights. Kwong taught the practice of postures and forms to enhance chi flow and the control of vital breathing with movement. In fact, Kwong had the ability to hold his breath for as long as five minutes, longer than most trained skin divers. Dr. Fang Huai-shih, chief of the physiological department of the National Taiwan University Hospital, said it was a very rare phenomenon which had much to do with one's physical well-being. It was written in the China News in Dec. 31, 1964 that Dr. Fang tested 157 Chinese Air Force fliers in 1942 and the average time they could hold their breath was 65 seconds. An ordinary man could hold for about 45 seconds. Master Kwong's ability to hold his breath for five minutes is considered to be a world record. Kwong was also trained in nurturing his psychic center and various nerve centers of the body. He could sit in meditation for hours without moving a muscle. Master Kwong practiced Tai Chi Ch'uan, Tai Chi Jyan, Pa Kua, and Hsing-I. He also taught various forms of Shao-lin, such as Flying Dragon Jyan. He was a master of Taoist longevity and Meditation exercises. He had been teaching for well over thirty years when I first met him. Kwong was not a purist when it came to teaching Chinese Kung Fu. He felt you could never make a living by only teaching, so he worked. He enjoyed working and was paid well for his knowledge. He would teach his martial arts every day after his work was over. Because he did not rely on his martial arts for a living, he kept his teaching prices very low, so people could afford to learn. It cost about $20.00 per month to learn in a group class. I always considered that private lessons were the best way for me to learn. Although the cost was higher, the quality of training was excellent, and I always received the type of training I sought. At the time that we met, I needed Kwong's teachings. Without his direction, I never could have fully appreciated the methods of Master Ch'ang Tung Sheng later, nor been able to learn Ch'ang's methods without Master Kwong's teachings. Master Ch'ang did not teach the way Kwong taught. Ch'ang expected you to learn quickly without going into explanation of details of basics. He expected you to know something before he taught you anything. He had little patience with beginners, but Kwong had a totally different approach. He was careful and thorough, and had a world of patience for the beginner. His teaching was technical and precise. He taught slowly and methodically, regardless of what the student knew already. Each move was carefully studied and practiced until the student fully understood. Basics always came first, and he reviewed each step to assure that you could do it properly. If you could not do the move to his specifications, he would patiently review it, and have you practice it all over again. In order to advance with Kwong you had to display what he showed perfectly. If he saw no errors he would move you ahead in training. Because of my background, I went through his teachings quickly, without much need for explanations or numerous corrections. For this reason Kwong showed a great deal of his skill to me. I would follow him everywhere to pursue his teachings. One time he went on a vacation in upstate New York. Little did he know that I had followed him and checked into the same motel. In the morning, I knocked on his door and said, "Hello, Master, I am ready for class." He was shocked that I had followed him, but was impressed by the interest shown in his teaching. We pushed all the furniture aside and had a class right there. Had Kwong been of a different nature nothing would have persuaded him to teach as much as he did. Kwong was not concerned with amplifying his fame. He had already attained a good reputation, through the teachings he had received, and through the high quality methods he used to teach others. He was not interested in running a Kwoon. He liked to be free to teach where he pleased and not be committed to any one group of students. He was deeply religious - a devout Buddhist and Taoist. He practiced both, as many Chinese do, taking parts of both worlds of thought. He had little social life that I know of. He simply taught quietly and practiced his beliefs. When he died his remains were laid to rest in a Buddhist Temple in Kent, New York. As for Kwong's Tai Chi Ch'uan, he always claimed he taught the original style that his Master taught, unchanged or modified in any way. He was one of the few Masters who taught the full complement of the one hundred and eight (108) push hand methods. He began with single hand methods and progressed to two hand methods with fixed steps, active steps and, finally, moving steps. Even today it is hard to find a teacher as thorough as Kwong, who taught so many techniques. Many teachers today concentrate on only a handful of methods. Kwong's approach was a complete system. Kwong's teachings on push hands were as thorough as his teachings of the solo form. He would carefully show a pattern, and once you learned it, he would show a counter for that pattern. He kept on doing this until the student learned how to use the counter moves to each pattern taught. Once all the patterns were learned he would teach one to combine the various patterns until the student could easily create combinations of patterns as the need arose. This procedure would continue even into his San Shou ( Tai Chi two man set) applications. This way, a student had an overall understanding of how to use all aspects of Tai Chi Ch'uan for health, as well as for combat applications. Master Kwong's approach to teaching each of the internal arts was the same. 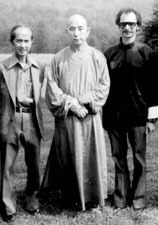 He was one of the most organized teachers I ever had (see photo to right of Master Kwong and myself). Master Kwong Yung-cheng left behind many followers. They are scattered around the world, still proclaiming the benefits of Master Kwong's Kung Fu teachings. To this day I am still passing on the numerous techniques he taught me and stand honored to have studied privately with this marvelous martial artist. I recorded over sixty audio tapes of private conversations with this Master and hope one day to write more about Master Kwong's insights into Chinese Martial Arts. Until then, I hope this small tribute to Master Kwong will suffice for those eager to know about true Masters. Kwong Yung-cheng holds a special place in my heart for he influenced everything I teach and profess today. The students he taught are without number. The number of people he affected is boundless. The past thirty years have been a sad time in martial arts history, for we are losing the great Masters who have molded the history of our beloved art. Truly Kwong Yung-cheng was one of them. It is my hope that this portrait of Master Kwong will rekindle some memories for those who knew him. As for those who never had the chance to know him, I hope this article will make them aware of the greatness of Kwong Yung-cheng, the "Professor of Shadow Boxing". In this photo Grandmaster Ch'ang is sitting in judge's seat just after our fight, from the left standing are Wu San Ju, the referee appointed by the Kuo Shu Federation of Taiwan to officiate our fight, and myself.